Help! -The truss rod's stuck!! Discussion in 'Tele-Technical' started by Eivindpicker, Feb 21, 2008. -I tried to adjust the neck on my Nashville b-bender tele yesterday and found that the truss rod's completely stuck. It's probably been stuck for a while, course the previous owner have filled some of the frets flat in stead of adjusting the truss rod (making the intonation a bit off also..) Anyone who got a tip or two how I can loosen that bolt?? It adjusts at the headstock, right? I have a Standard Stratocaster from the late 80s with the same problem. The truss rod nut cannot be turned to correct the bow in the neck. I already gave it to one "luthier" who took the walnut plug out, removed the truss-rod-nut and reinstalled the plug again. Here's my 2 cents...find the best luthier available, have him do the above operations and when you pick up the guitar check that the truss rod nut can be turned freely. One little trick you can try is, take the adjuster nut off completely and slip 2 or 3 flat washers on the truss rod. In some instances where the adjuster nut is bottoming on the threads, this will give you a little extra room for adjustment when trying to fix a positive bow. You may have to shop around to find the right size flat washers but it's worth a try. I have saved a neck or two by doing this. When you say the truss rod is stuck, are you talking about the ajusting nut? Can you remove the adjusting nut or is it stuck to the rod? If it's stuck to the rod I'd like an answer myself. I have a G&L that appears to have had the nut turned until there were no more threads and the nut was snugged up tight against the unthreaded part of the rod. When I turn the nut counter-clockwise a small amount, it springs back when released. In other words, turning the nut is twisting the rod. I've tried everything you can imagine to get it unstuck. Thanks for your answers everyone! -And yes, the nut's stuck. When I try to adjust the truss rod, I can't move the nut at all. I've used all the force I dear to without breaking the umbraco. There it was!! It's loose!!! -I forgot the guitar in the trunk from yesterday, took it inside and tried turning the nut... -No problemo!! I guess the temp. changes helped. Thanks for posting anyway! Well it was 40 Degrees F last night in Halden so that might be the answer. Yeah, That sounds like a good idea. Thanks. Mother Nature is just a wunderful Thang ! Lube-Tork, or molybdenum or copper anti seize paste would be best. Auto parts supply places sell it, and it isn't expensive, and goes a very long way. Yes this works if the nut is jammed all the way onto the last thread. Kind of wish it had been done on a lot of Les Paul type guitars with acorn nuts under a trussrod cover. However on an Am Std biflex trussrod you have to remove the metal plate or gate that sits under the string nut. The trussrod adjusting nut will back up against this gate and push the other way in order to correct back-bow, hence the "biflex" designation. Also, in order to back out the trussrod adjusting nut, you have to remove the walnut plug (with a Dremel or similar grinding tool, a drill just doesn't get in there without chewing things up). Then add the washer or spacer, lube and replace the nut, and reinsert the gate, replace the string nut, and then deal with the missing walnut plug (brown tinted lacquer camouflages the hole in the maple headstock pretty well, but a replacement walnut plug would be the best fix). Eivindpicker, make sure that this isn't the reason that the nut froze in the first place. Loosen it then turn it back and see if you're hitting a spot where it suddenly doesn't want to turn anymore - if so you could already be right up against the end of the threads. If you still have too much relief, then the right fret dressing could get you some more relief a Plek might be worth it), and some luthiers are experienced in doing a "compression" refret to get a little more spring in the neck. Good luck and keep checking back here for more solutions in search of a problem. However on an Am Std biflex trussrod you have to remove the metal plate or gate that sits under the string nut. The original drawings submitted with Fender's patent application did have a metal plate that the truss rod nut backed up against. However I think this was later replaced with a metal washer between the truss rod nut and the walnut plug. Probably done to speed production. They call that "value engineering". 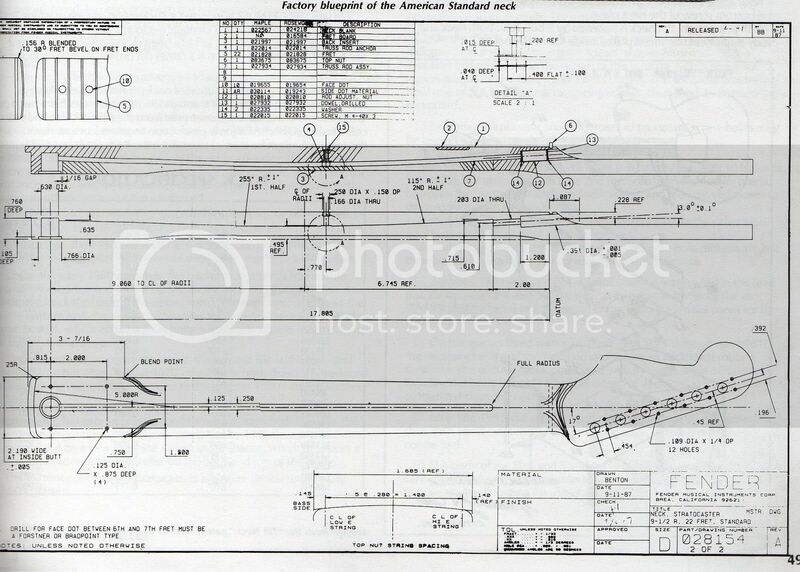 See Item #14 in this Fender neck blueprint. Here's a drawing from the patent application showing the original metal plate. It pays to lube (grease, no oil) all truss rods nuts, I use white lithium grease *sparingly* to both the threads and face of the nut. Jack, Sometimes you can try heating the nut with a big soldering gun (like a 260 watt Weller gun) as a last resort. Try not to scorch the finish if you can help it, but sometimes the high temp will loosen it up enough to get it moving again. I've made my own copper tips from #12 house wire, and been able to get the tip skinny enough to clear the wood, but still contact the rod/nut. Obviously, don't burn yourself with the nut.. they get really hot, and take a while to cool down. Be sure to clean and lubricate the threads when you reinstall. Vaseline does work, however I find it too oily and not greasy enuf - and I don't want the stuff seeping too much into the wood ... cup grease would be better, but lithium bike/cycle chain lube works best for me. Just don't use KY jelly. I'm currious ............. how would a little oil on the truss rod nut threads harm the wood? I'm asking this after years of finishing furniture and cabinets with Watco Danish Oil. Well ............ it does have its uses ........ maybe not for guitars or with peanut butter. Thanks for the soldering iron tip Rich. I've tried that already. I managed to get it hot enough to loosen the glue joint running below the G string. Still the nut is stuck. I think an earlier owner ran out of threads and just torqued it tight up against the unthread part of the rod. I think it's a situation where you need hold the rod while you attempt to back off the nut............. or course there's no way to do that. Can weaken the wood in an area of compression.